REAL PRODUCTS - MADE WITH 3D PRINTING ARE COMING! About two years ago an acquaintance of mine and I decided to develop something made completely with 3D printing that was not a plastic toy but instead was a real, working product. What we came up with stems from my own personal hobby, Radio Control Airplanes. 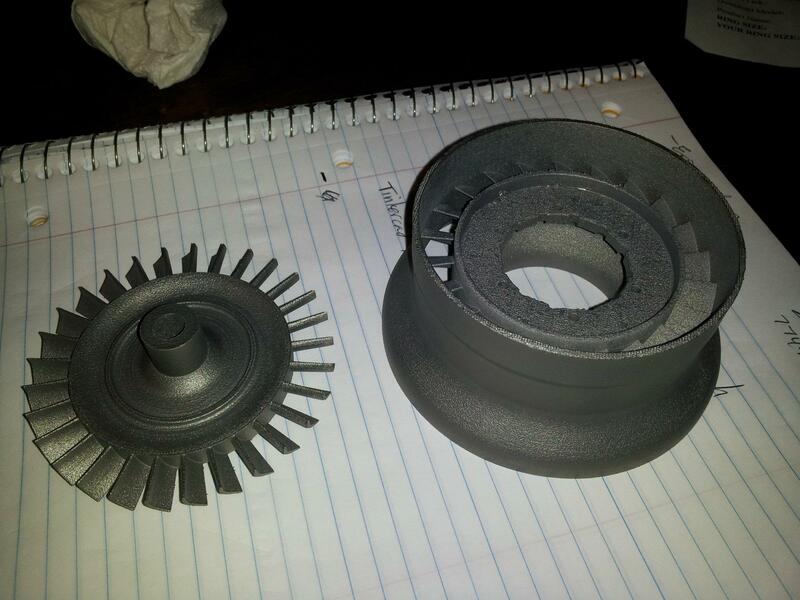 The result, a working turbine jet engine made using EOS DMLS (Direct Metal Laser Sintering) technology. EOS DMLS 3D printing is a terrific technology that most people don't really have access to you outside of the industrial sector. It is indeed 3D printing but it has some unique challenges to design around. 3D Printing metal requires structures and supports that are VERY difficult to remove when you have overhangs. DMLS is NOT for everything but in this case, it works beautifully for a 3D-printed turbine. The project has taken two years, working in my spare time mostly which isn't much but I think the results are quite impressive and the engine will work, I am sure of it. The only parts that are not 3D printed are the turbine shaft which was made on a lathe and the ceramic ball bearings. The materials used include Aluminum, Inconel and Stainless Steel. Power will be in the 55-65 lb thrust-class with RPM's at or above 80,000 rpm. The engine was tested and simulated using SolidWorks FEA simulation and flow analysis. The results are terrific. Along the path of design, we identified part count reduction that could make an engine out of 5 parts, down from 12 to 7 parts. Something else that happened along the way was the discovery that we could improve performance with geometry that was difficult to make using traditional manufacturing. For example: we were able to add bleed-air into the exhaust stream to reduce the temperatures of the exhaust gases which should improve the longevity of the turbine hot section. We also were able to create a beautiful casing for the turbine that is much more visually appealing that other turbines with the design. Finally, we also now believe that we can create a multi-stage axial flow compressor unit which essentially means more efficient engines.